Your bathroom is one of the most used rooms in your house and one that guests are most likely to use. Because of this, it is important that your bathroom is both clean and presentable. Not all bathrooms are created equal, which means some bathrooms will need some remodeling work. At ProSource® of Orange County, our showroom has a plethora of features for you to browse and incorporate in your own bathroom remodeling project. If you are looking to impress your guests, the easiest ways to do so is by changing up your bathroom sink. 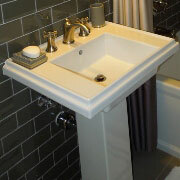 By installing a brand-new sink basin, you can transform your washing area to look more modern and interesting. Bathroom sink faucets are also another way in which to impress your guests. 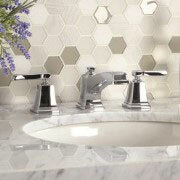 By installing a new-model faucet you can amplify the overall look of your bathroom. And, depending on the style you would like to adopt for your bathroom, your faucet is an excellent way to accent some of your style choices. After a long day, nothing compares to the soothing power of a shower. At ProSource Wholesale, our showrooms will be able to give you a full view of the latest trends in shower remodeling. At your local Orange County showroom, you will be able to browse the different shower displays and determine what style would coordinate best with your client’s home. 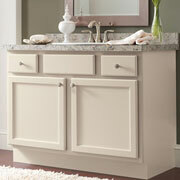 Vanities are a great way to optimize storage space in your home. If you are interested in adding a vanity to your bathroom, ProSource has dozens available to view on display and even take home with you! Only at ProSource showrooms will you be able to see such a wide-ranging selection of remodeling goods with such attractive price tags. 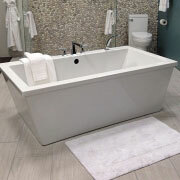 If you are looking to upgrade your bathing experience, getting a new tub should be step number one. At ProSource of Orange County, we guarantee you will find something to your liking and at a price value you can appreciate. Whether you call it a toilet, a throne, or a lavabo, everyone needs a toilet. 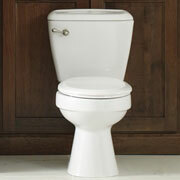 At ProSource of Orange County, we can offer our customers a large range of toilet models to choose from. Not only do we offer expertly crafted toilets, but we offer special guidance from us on-staff professionals. So, if you are looking for a new toilet, ProSource can help you gain the information and materials you need to see your remodeling job become a success.